Two years ago, when we moved into the house, I bought some Tagetes patula 'Durango Bee' plants along, which performed nicely and which I enjoyed. At the end of the season, I went out and collected a bunch of seeds, intending to plant them the next year and see what happened, and then last summer I didn't wind up planting anything anywhere, for what were no doubt noble and logical reasons, so the seeds wound up sitting in my file cabinet. This spring, I remembered that I had this container filled with hundreds of seeds, and figured that even though they were probably no good anymore, I could try to sprinkle them around outside and see if anything grew. If it worked, hooray, and if it didn't, at least I'd emptied out the container. I didn't get very many at all: maybe 20 or 30. And the ones I did get all look like the originals, which is both good (I liked the originals) and bad (unsurprising). But that's still better than I'd expected, so I'm happy with this. Next year I'll know to try to start them earlier, inside, and have a designated place to plant them. Thanks for the great picture. I'm not a big fan of marigolds but that one could change my mind. Lovely. I like Marigolds. They also help protect other plants in the garden. 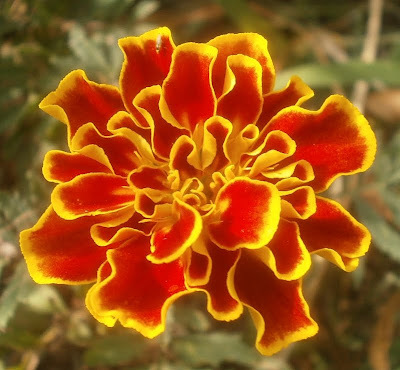 I really like marigolds, and this is one of my favourites. Very pretty colours. I love your blog so hard. The pictures are great, the information is top-notch, the writing is interesting. Thanks for putting this stuff out there.